The audience itself – visibly more diverse than the Republican Convention crowd – is the symbol used to emphasize the message of inclusion. Ostensibly, viewers at home can easily imagine themselves as audience members. 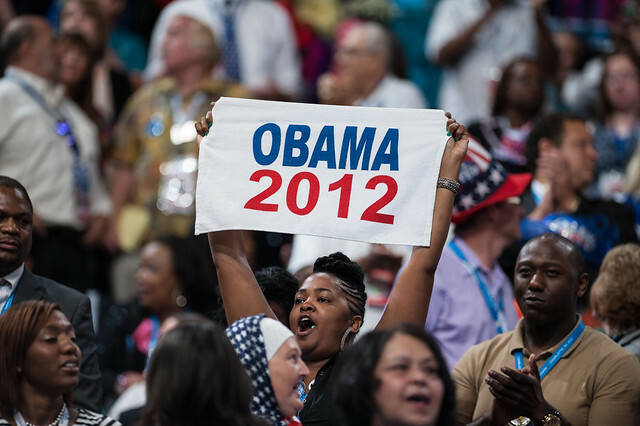 If the people at the convention embody the Democratic message of togetherness, the stage space itself remains abstract. In analyzing the relationship between form and meaning, sometimes the most persuasive form is the blank slate ready to receive the viewer’s own projections. We all know both conventions are incredibly orchestrated. The spaces for these performances successfully communicate their respective messages. While the Republican message is to retreat inside – to a safe place, in the home, by the hearth with your nuclear family, the Democrats push the perceived boundary of inclusion as far out as it will go. The symbolic public participation is effective: the stage is not the ideal home, the stage is an open platform for inclusion. Post by Claudia Paraschiv. Claudia also reviewed Ann Romney and her RNC Stage. Claudia, Really appreciated these analyses. Thanks for reminding us that our visual experiences are hyper-designed, especially our televisionary experiences. I have to say that, as a liberal, I was pretty pleased with the DNC stage design. I think it successfully hammered home that message of “togetherness.” By keeping the stage void of any clear style (no reference to any specific Americana), viewers like me were free to imagine ourselves in the crowd. The lack of cultural references meant there was nothing in the way of my developing a sense of belonging. Though the Ann Romney visuals may have meant to evoke a feeling of “family” – I think they also evoked a feeling of “past” / 1950s nostalgia. While this certainly appeals to some segment of society, those sepia toned images were pretty repellant for me. They underscore the message of “going back” to a time that never was for me and many others. But then again… those images weren’t designed for my engagement.